Indian Defense Minister Arun Jaitley greets U.S. Defense Secretary Chuck Hagel in New Delhi, India, Aug. 8, 2014 (AP photo by Manish Swarup). 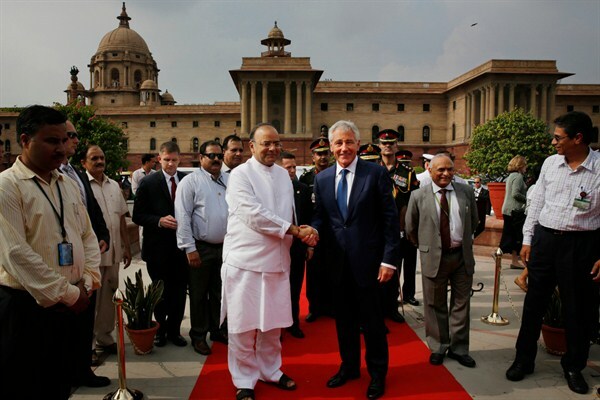 Last week, U.S. Secretary of Defense Chuck Hagel visited New Delhi on a political mission to sound out Prime Minister Narendra Modi’s new government on the Defense Trade and Technology Initiative (DTTI) first proposed two years ago by Hagel’s predecessor, Leon Panetta. The United States is promoting DTTI as the “centerpiece” of the India-U.S. defense relationship going forward, hoping it will lead to a renewal of the New Framework for Defense Relationship signed by both sides in 2005, which expires next year.